As the thread title says, this is a CTF + Veh map. 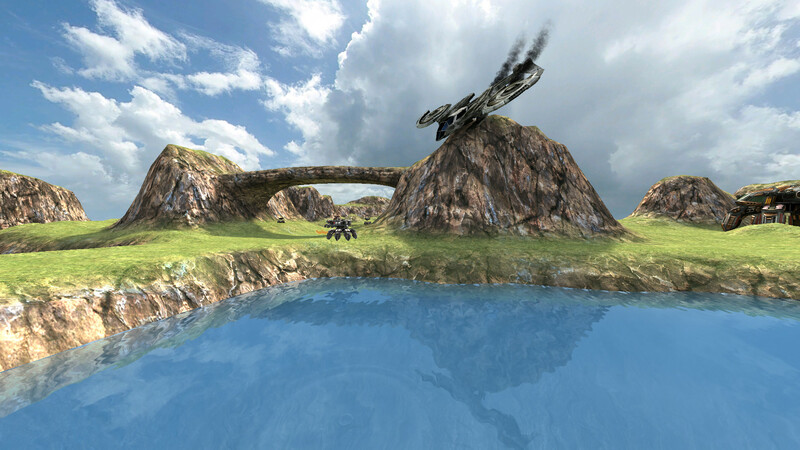 It is an experiment I started some time ago with terrain and water surfaces plus the engine's particle system. I'm not expert, so dont spect any good performance or gameplay from this my very first CTF map. First release of the map. "dpWater" shader directive (reflection & refraction). - Top surface which adds color and different opacity levels. - "alphaGen vertex" directive to enable vertex-controlled transparency. - Use of "alphaMod" brushes to set the different values for opacity. - "surfaceparm water", "surfaceparm nonsolid" and "surfaceparm noimpact"
directives are of NO use here, remember: the water is 3x ASE models now. - No "q3map_lightmapFilterRadius 16 0" in terrain shaders anymore. - Avoiding Z-Fight seems harder now. the water while none underwater. As stunning as this map is, I feel obliged to mention: The .mapinfo file contains an insane list of server side cvars modified. Those who wish to use this should be warned that their entire server's weapon and vehicle balance will be changed every time they switch to this map. Many of these are personal balance preferences too, so you may be better off using a private configuration file for testing. I understand it's very difficult to work around, but the easiest way would be to treat this like an island and have an infinite water clip (like oilrig) extending beyond the playing area. Really impressive work either way, keep it up! Updated the first post with a new version of the map. Map looks pretty awesome from screenshot. Gonna download it and give it a spin. Woah! The reflection glitch present on the water shaders is non existent here (the one where you can go underwater, look up, and see you and the floor)... Your tweaks need to find their way into the main game. (11-05-2017, 05:36 PM)Lee_Stricklin Wrote: Woah! The reflection glitch present on the water shaders is non existent here (the one where you can go underwater, look up, and see you and the floor)... Your tweaks need to find their way into the main game. IMO, the reflection of the player's model does not looks very nice in a horizontal plane like a water surface. And then, there is the underwater part, where any reflection effect looks really out of place.